Good old #12 shot is pretty rare nowadays, and most people don't even know its purpose. If you live in Arizona or the Deep South, you already know exactly what #12 shot is – snake ammo. This seems like a very specialized use for a line of ammo, but when rattlers, copperheads and other legitimately scary snakes are infesting your property, you don’t want to get close to them. #12 shot will take care of snakes and other potentially dangerous small animals. This ammo type typically comes as #12 lead shot, and the amount of pellets per shot is staggering. It can be found in shotgun shells as well as pistol ammo. There are a few companies making rimfire and centerfire cartridges, but the most prolific by far is the line of pest shot ammo from CCI. The interesting thing about this ammo is that for years, if you wanted to shoot a snake shot load in a handgun, it had to be in a revolver. Today, CCI makes #12 shot ammo for 9mm as well as .22LR and .22 Magnum. Exactly what this ammunition was made for, #12 shot is very good for snakes and rats – but you will have to be a lot closer than if you were shooting something larger, like #9 shot. A range of about six to 10 feet seems to be the rule for this ammo, and guarantees you’re going to kill even a large snake. Past 10 feet, you’re just going to hurt something or make it very mad! #12 is not allowed for clays and other types of competitive shooting. This is because the spread of so many pellets takes the “game” out of it. They rarely cause a lot of damage to a target, but they almost always hit it more than a few times. 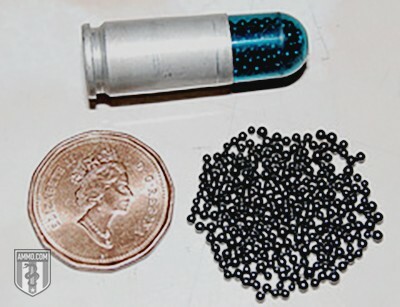 This is a good shot for messing around in your backyard or on your property, but remember to use something like hay behind your target – as these pellets can sting badly on a ricochet, go through the skin or put an eye out pretty easily. This ammo can be difficult to find, as local stores normally carry a limited stock of this specialty shot size – which is why many people use online resources to get their #12 shot. While not well suited for hunting, #12 shot is very useful for pest control and is a great choice for the outdoorsman in need of effective protection against snakes.